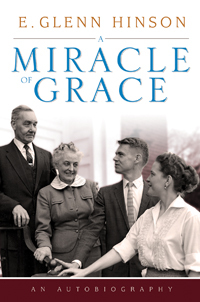 This is the story of Glenn Hinson’s life—A Miracle of Grace— “for I stand with mouth agape as I look back from where I am at age eighty toward where my story began.” With degrees from some of the world’s most noted schools (Washington University in St Louis, Southern Seminary, Oxford University), Hinson has taught in some of America’s most distinguished educational institutions (Southern Seminary, Wake Forest University, Catholic University of America, Notre Dame, Emory University), and has played a modest role in some of the most momentous ecumenical developments in Christian history since the Reformation of the sixteenth century. Who could have foreseen much less predicted any of those happenings from a glance at his early years growing up in dire poverty in the Missouri Ozarks during the Great Depression? Training in both New Testament and Church History put E. Glenn Hinson in an unusual position to take part in the ecumenical movement as it evolved under the influence of Pope John XXIII and the Second Vatican Council. Through participation in the Faith and Order Commission of the World Council of Churches and in both national and international Catholic/Baptist conversations he was fortunate to take part in some of the most notable developments in modern Christian history such as the framing of the Baptism, Eucharist, and Ministry document of the World Council of Churches. Taking the first class of students to the Abbey of Gethsemani in 1960, he developed a friendship with Thomas Merton. The question of questions Hinson attempts to answer in this book is how this story could unfold like it did. Years of reflection have led him to think that the answer lies in the mysterious way God works in human lives and the Apostle Paul’s and Augustine’s understanding of Grace. Read the story and see if you agree.